Every time I hear Square Enix talk about the Final Fantasy 7 Remake – announced to gasps and sweaty excitement during Sony’s E3 2015 press conference – the game seems further away. This week, to celebrate the 30th anniversary of the role-playing game series, Square Enix released a single, solitary piece of key art for the remake. 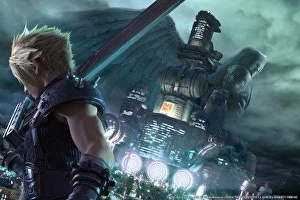 The image, below, shows Cloud holding his Buster Sword set to the background of Midgar, base of the Shinra Electric Power Company. And who’s that in the background? Yep, it’s a giant, towering Sephiroth, complete with angel wings. The Final Fantasy 7 remake was announced a year-and-a-half ago, but it sounds like it’s still in the early stages of production. Famitsu magazine recently interviewed producer Yoshinori Kitase about the timed PlayStation 4 exclusive, and, according to translation work by , gave a progress update.